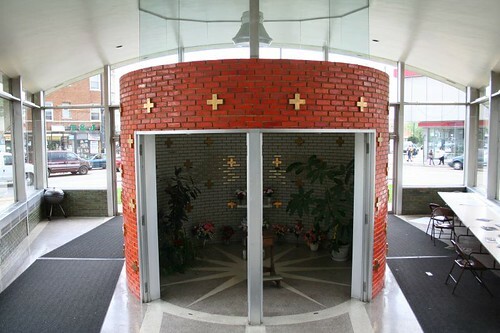 This entry was posted in Midcentury churches, Mosaic Tile, South City, Stained Glass. Bookmark the permalink. Love this one. Have any info on the architects? What else did they do? 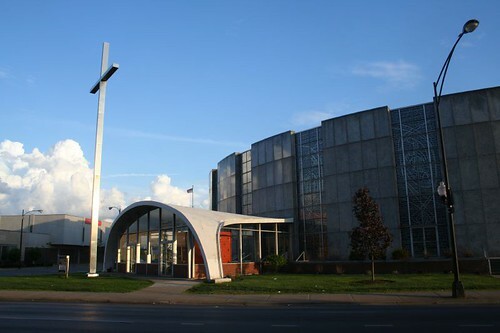 When I was a child we’d drive past St. Gall’s after visiting my grandmother at 47th and Kedzie. The bold orange baptistry really stood out! I remember my mother saying how this church “was something else” when it was built. You have to remember, this was built before the Second Vatican Council. A church like this was not something the devout middle class Poles in Gage Park (or Catholics anywhere, for that matter) were accustomed to! Hey man, where have you been? I miss reading your new stories. Please come back soon. I could almost become religious looking at buildings like that! wow. . . this is quite a blast from the past for me. Thanks for these photos.I went to St. Gall's from kindergarden through the 8th grade. My mom pressured me into saying I wanted to be a nun and for many years, I went to daily mass, was the pet of the nuns and prayed a whole lot in that church.I was very seriously, in my childish way, about my spiritual life. I am no way Catholic now . 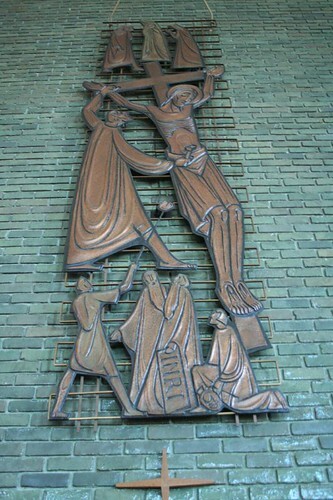 . . but I was very seriously about my religious life back then.And I deeply loved our modern church, its modern windows, its modern stations of the cross and taht beautiful baptismal thing with the gold. I deeply loved the bluegreen bricks. 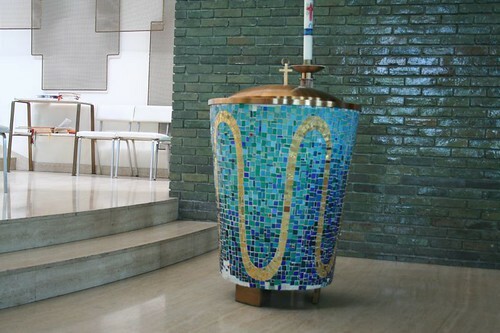 I believe our parish was very up to date and the modern building reflected it. I was so proud that I went to such a special church and this pride was specifically connected to the building's architecture. 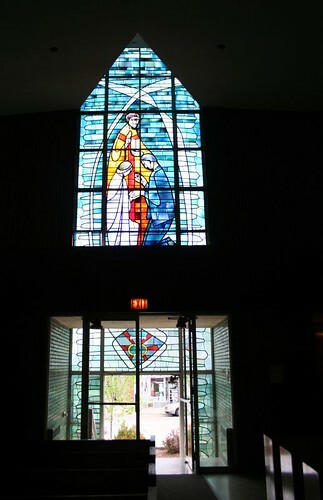 The building had a very meaningful impact on my religious practice of the time.thanks for the walk down memory lane. Served as an alter boy here. I wonder if the basement church is still there? I loved the building and think of it fondly still. It was magical for Christmas midnight mass when I would also sing in the choir. A lot of great memories for me! 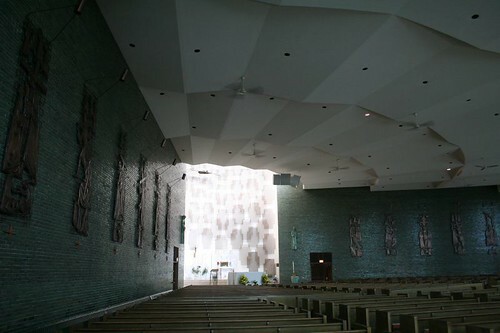 Both my sister and I were baptized here, and I attended catechism classes at the school taught by Sister Francesca Cabrini. We moved to La Grange just as construction was planned to begin on the new church, but I recall how the old basement church flooded during heavy rain and that I wore boots to Mass one time. I’m such a big fan of mid-century architecture and this building is iconic.